102 plastic parts on 5 x grey spues, 1 x clear. The kit provides great value with the inclusion of an excellent Resin cockpit, Photo etch, masks and six decal options. 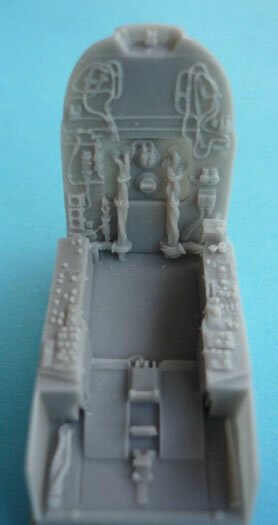 Plus this is the only UB (two seater) available in 1/48. Lack of painting guide for the cockpit. Single piece canopy vice sectioned canopy. 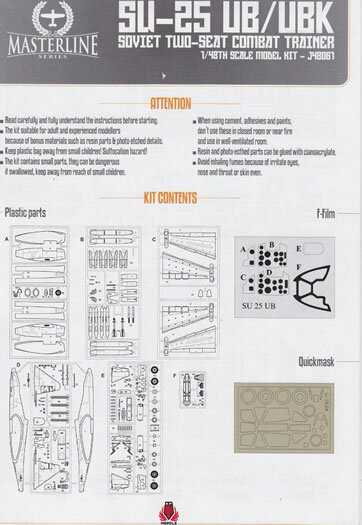 This kit is recommended for those that have worked with PE and resin before, and to display this models best feature, the cockpit, there is some detailed cutting of the canopy required. 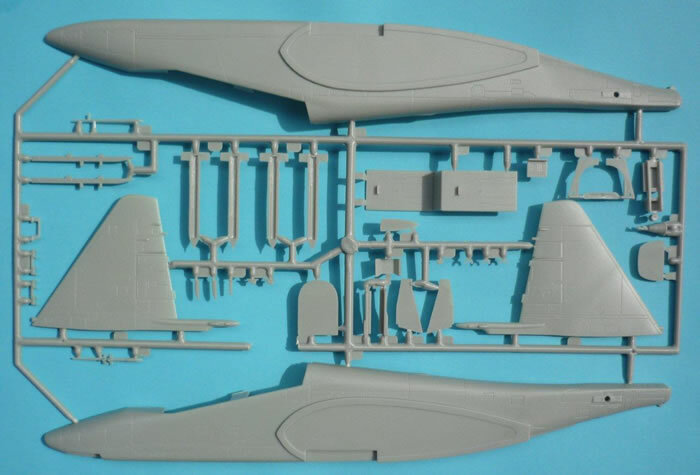 This kit will make a very attractive Su-25UB and will look great when festooned with weapons. 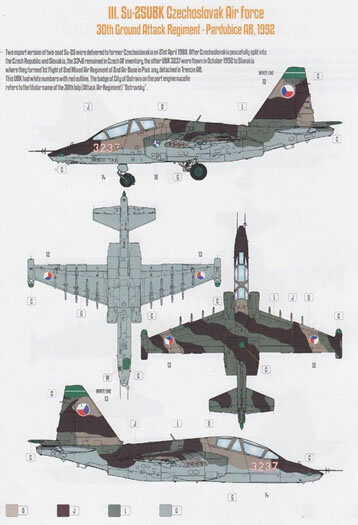 The Sukhoi Su-25 Close Air Support aircraft first flew in 1975 and began entering operational service from 1978, designated Frogfoot by NATO the Russian armed forces know the single seat version as the "Grach" ("Rook"). The Su-25UB trainer (Uchebno-Boyevoy) first flew in August 1985. The UB was intended as an operational trainer for frontline pilots. While an extra cockpit was added, the performance of the Su-25UB does not differ substantially from that of the single-seater. The navigation, attack, sighting devices and weapons-control systems of the two-seater enabled it to be used for both routine training and weapons-training missions as weapons pylons and the gun are retained. Externally the UB has the following differences from the Single seat variant, the rear seat is raised considerably, giving humpback appearance; separate hinged portion of continuous framed canopy over each cockpit; taller tailfin, increasing overall height to 5.20 m , new IFF blade antenna forward of windscreen) plus an optional periscope over the rear cockpit. 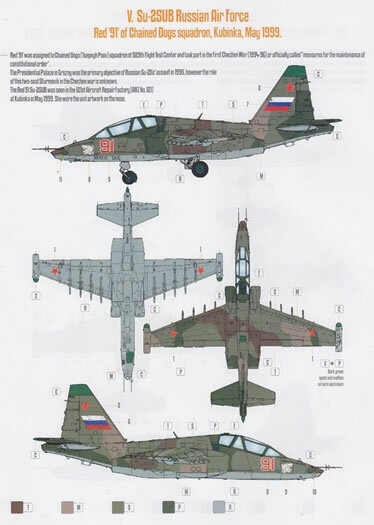 From 1986 to 1989, in parallel with the construction of the main Su-25UB combat training variant, the Su-25UBK export variant was produced for countries that had bought the Su-25K. 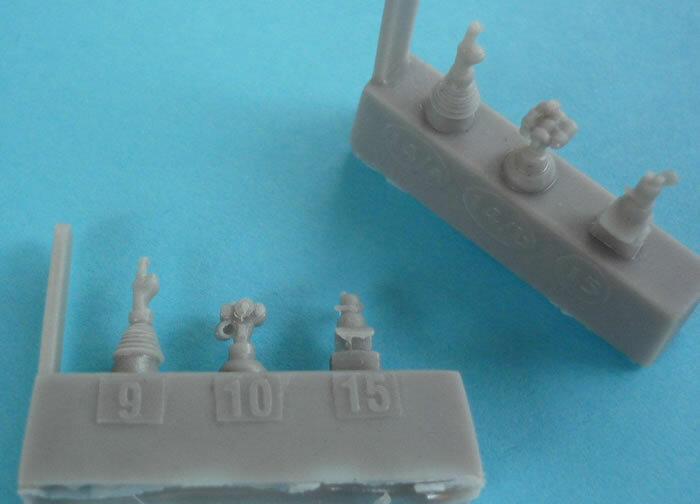 Since KP started manufacturing a few decades ago and during this time of scale modelling related technology has undergone tremendous progress, some moulding tools needs to be maintained and upgraded. 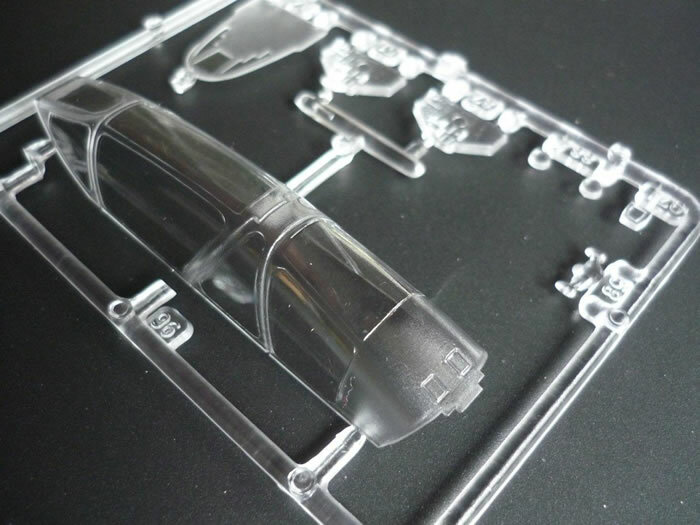 The maintenance of several injection moulding tools had already began to achieve crystal-clear transparent parts, nicely engraved panel lines & raised rivets and remove pebbly and/or irregular surfaces where it’s necessary and possible. In addition, we’re planning to pack exciting and never released paint schemes and marks into new KP boxes…. 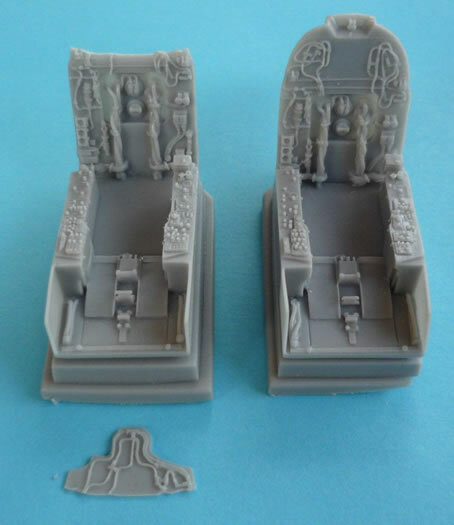 Furthermore we would like to treat the modellers with some fine resin and photo-etched parts in the boxes to provide modellers high detailed kits. 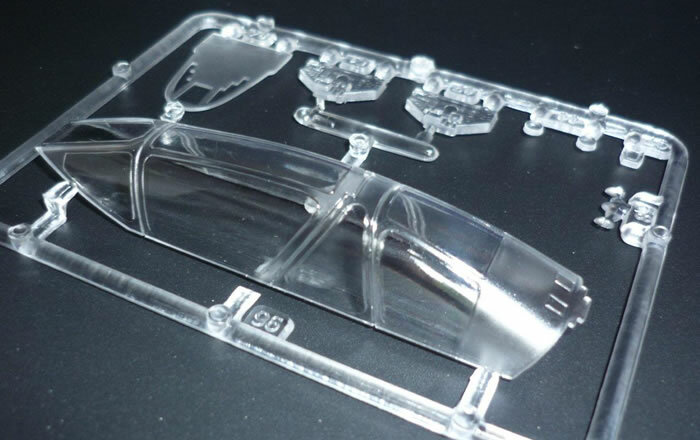 In 2011 we will expand our offerings with some brand new product in 1/48 scale. Masterline in our definition means a high quality kit series of KP Models. The box includes bonus materials such as resin parts, photo-etched details, mask for the clear parts and other goodies. When I received this kit for review I had not heard of KP models before, so after some searching around the internet I came to the following conclusions, yes the main plastic in this kit appears to be from the moulds that originally produced the OEZ/KP and Eduard kit, however as the website points out the moulds have seen some maintenance and upgrades, so onto the first look. This kit comes in a very sturdy box with some magnificent art on the box top, opening the weighty box reveals a padded bag that contains the resin (the rear bulkhead one cockpit was damage, but is repairable) , a separate ziplock plastic bag contains the clear part, photo etch, acetate film and quickmask. 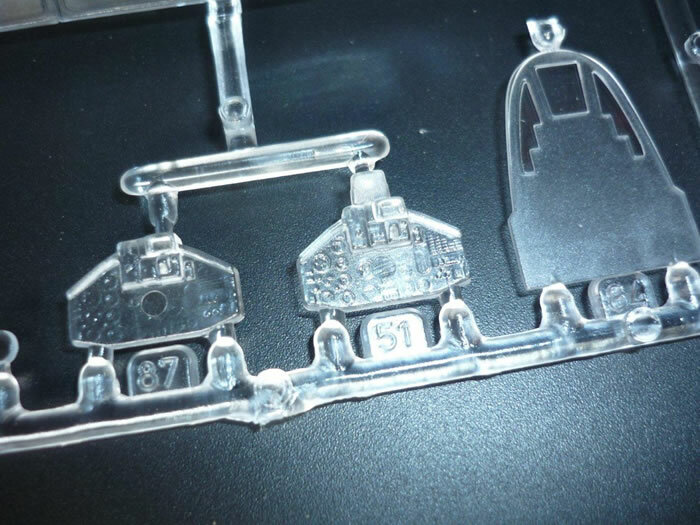 A single plastic bag contains the five plastic sprues. Finally a 10 page A4 instruction sheet printed on high gloss paper that also contains the decal sheet loosely within the pages. 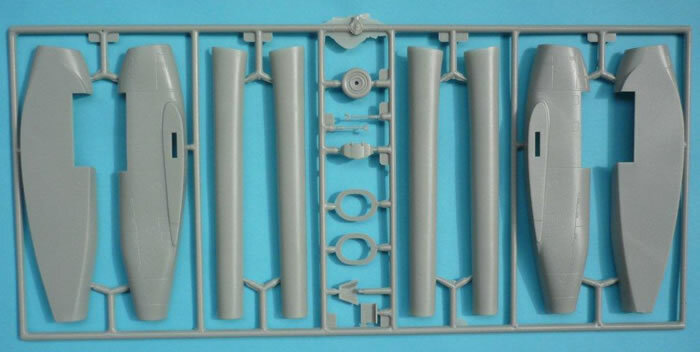 The plastic is free from flash however, there are only three locating pins on the fuselage with none on the wings (only one tab to locate the wing to the engine nacelle) or any of the other sub components, and some care will be required when attaching the engine nacelles to the fuselage. There are a few ejector pin marks to clean up in the engine trunk, cockpit and wheel wells but these are minimal. 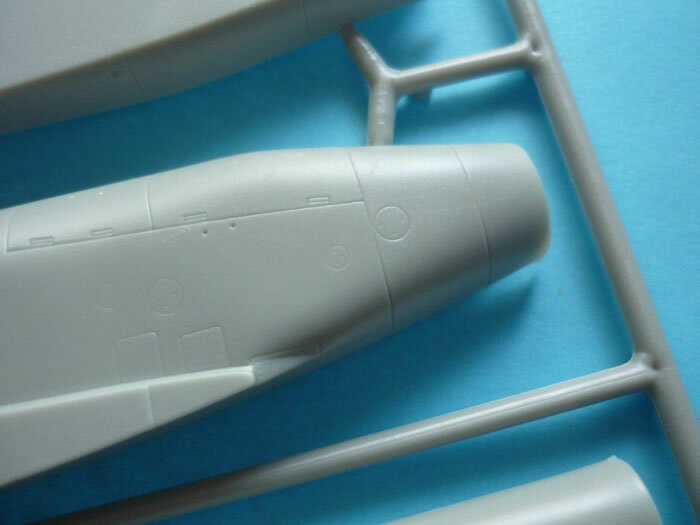 While the plastic looks good and the panel lines subtle one feature of the SU-25 not present is raised rivets in certain areas, however in this scale and after looking at numerous images on line it is the panel lines that are apparent rather than the rivets unless you get up close. The clear plastic while thick, suffers from no distortions and once separated , cleaned up and dipped in future will look good. 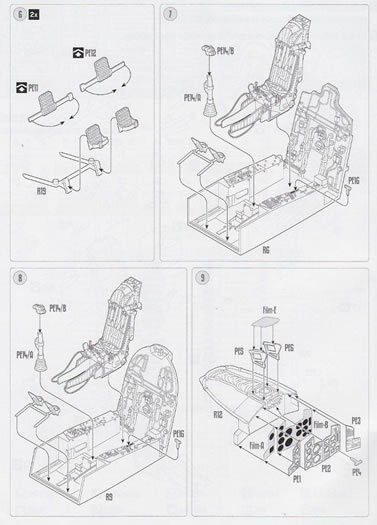 Construction begins with the resin and PE ejection seats; these are very highly detailed as each seat is made up by 29 pieces. 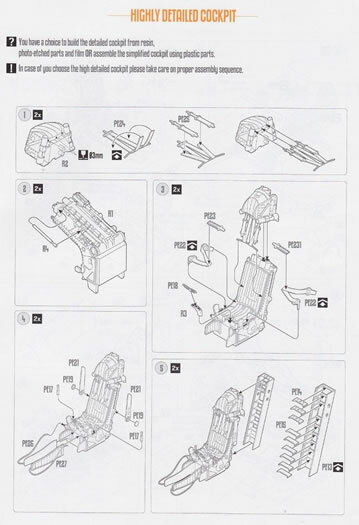 The instructions have a detailed guide to show where to cut the various piece from their casting blocks. The resin cockpit is next, the detail on the resin parts is excellent and the only drawback with the construction of the entire cockpit is the lack of any painting guide. I have found some reference online to using Gunze/Mr Hobby H417/C417 (or light turquoise FS 34115) as the basic cockpit colour. 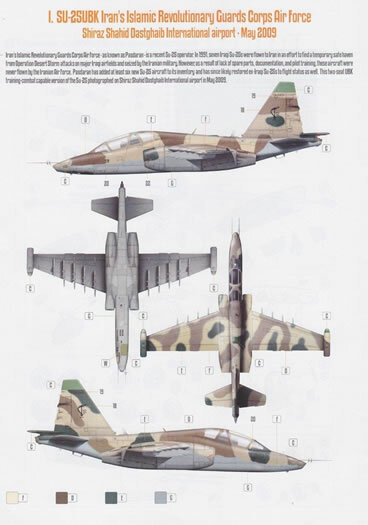 That said your references will be essential, given the number of nations that operate the Su-25 and how they individually service the aircraft there are bound to be variations. A quick search on the web will bring up some good walk around images. 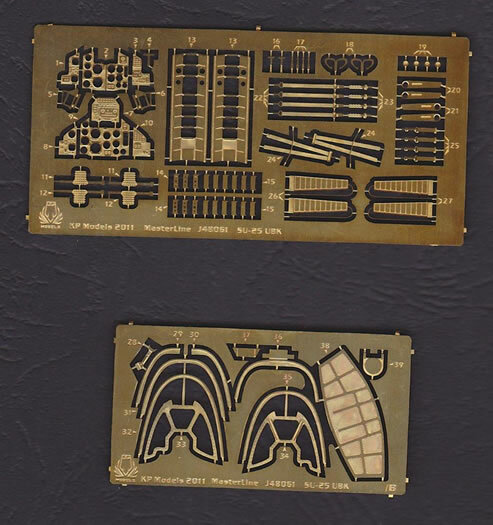 If you were to elect to use the original plastic cockpit there is a basic painting guide. 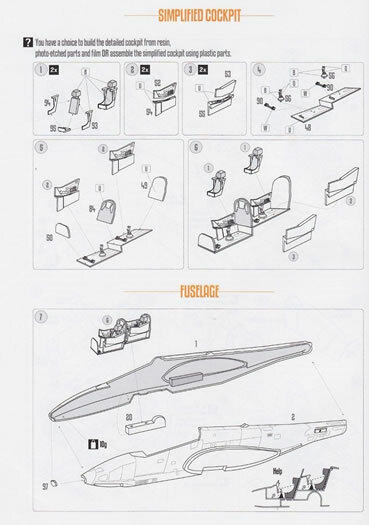 Given the detail and effort that has gone into producing a great resin cockpit the whole assembly is let down by the lack of painting instructions. 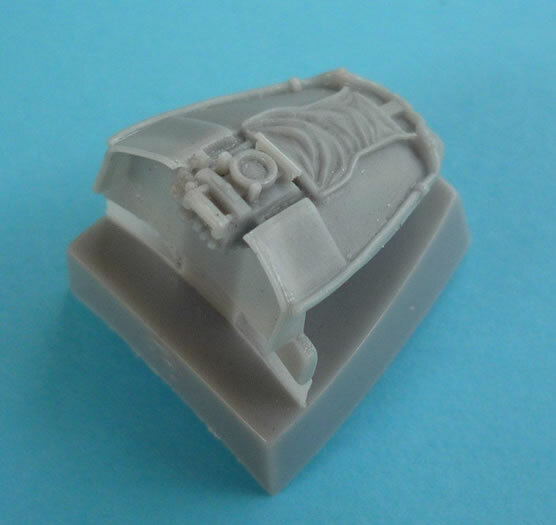 The side of the box has some colour pictures of the completed cockpit but no specific colours, these images are replicated on the website. A lot of research and reference material will be needed to do justice to the excellent resin/PE set provided. The first step has you cutting the canopy apart to accept all the photo etch pieces that make up the canopy frames. What would be nice here, if KP Models had provided two canopies. If you elect to display the canopy open (and why wouldn’t you given the great cockpit detail) it would be nice to have a spare canopy as backup. Quickmasks are thoughtfully provided for the exterior of the canopy but you will have to do your own, to mask the interior, as several sections have photo etch on the inside. The instructions let you know in advance that 10g of weight is required in the nose to prevent a tail sitter. With the cockpit nestled away the build will progress rapidly. 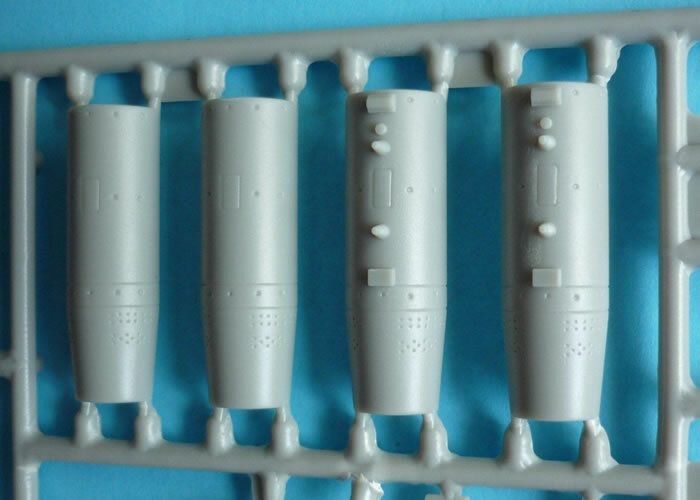 The engine nacelles are next, as mentioned earlier on there is a distinct lack of locating pins. 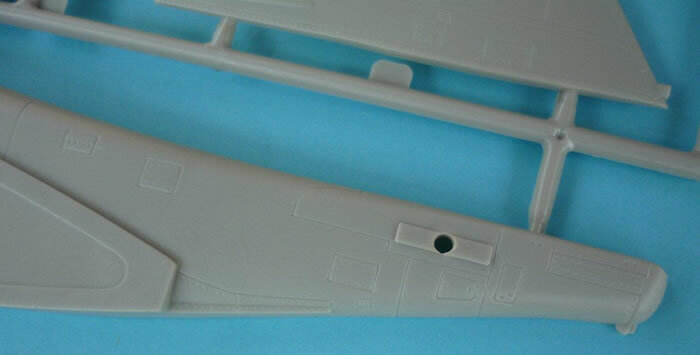 The main wheel wells are incorporated into the nacelles and are devoid of detail, that said, it is only during the transit of the landing gear that the door are fully open, once the landing gear is locked down 2/3 rds of the doors are closes, leaving little visible detail to be seen. Looking at various images it should not be too hard to add a little detail to the wheel wells yourself. The major sub-assemblies (Wings/Tail/Stabs and engines) are now attached. From here various antennas and scoops are added. The various air scoops are moulded without intake openings so a little drilling to open these will be required. The nose gear is split vertically so there will be a seam that requires cleaning up before attaching to the aircraft. The main gear appears solid in its design and has a good locating point to ensure strength. 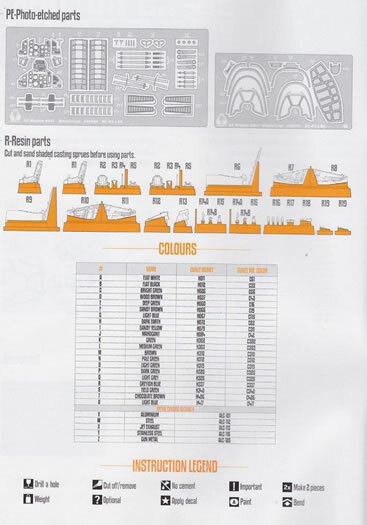 The painting guide is very detailed for the landing gear and the colour callouts are given in either Gunze Hobby or Mr Colour. 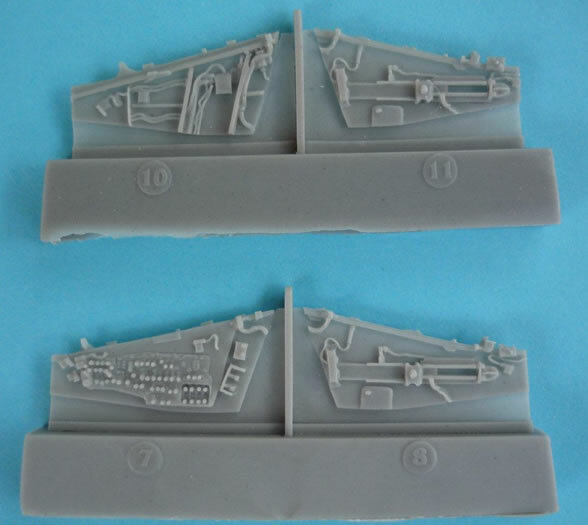 If you intend to display your Su-25 on the ground you are required to separate the landing gear doors. The weapons loadout diagram only shows 6 pylons in use. The B-8M rocket pods are hollow from the rear up to the nose cone, so you may need to insert a disc yourself to block the rear section off. The other option is to use resin weapons that are available from aftermarket manufacturers. 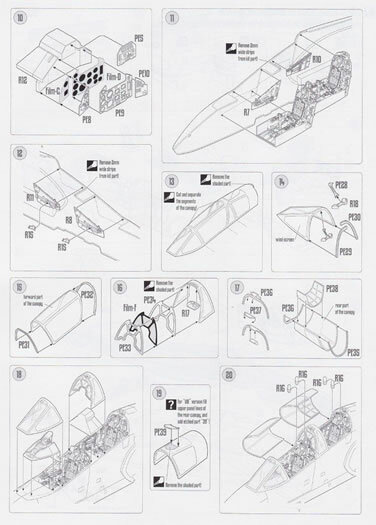 There are 23 quickmasks provided for the canopy, wheels and various clear parts on the fuselage. Full four view colour diagrams are provided for 6 different painting options and a final 4 view diagram for stencil placement. All paints are called out in Gunze/Mr hobby with the exception of metal colours that are listed in ALCLAD II colours. A quick look at the Peruvian and Iranian aircraft show that a lot of good research has gone into these decals. 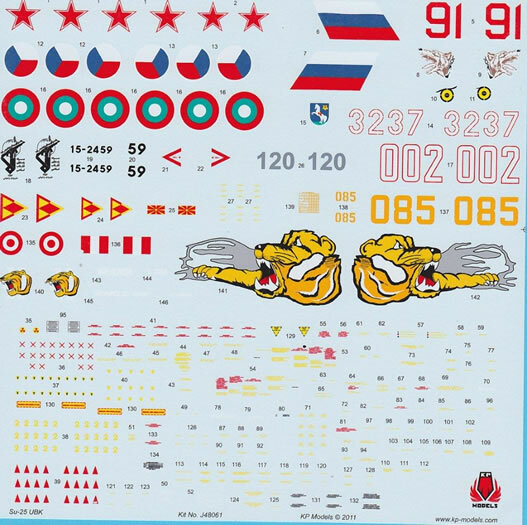 Decals are all printed on one sheet. The colours are vibrant with the national markings in register, on my sheet the lower corner of the Peruvian tail flash appear to be folded over (Bottom left corner). The carrier film appears to be nice and thin, with the whites opaque. The decal manufacturer is not listed on the decals or on the website. 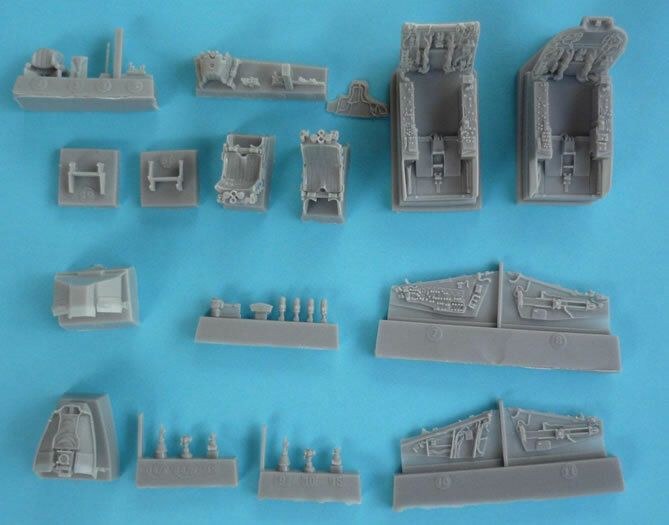 I have not previously hear of KP Models, or seen their previous releases however, after looking at their website and in particular the section on this kit ( which includes a long list of those who assisted in producing and researching this recent release), I would have no hesitation in purchasing other Masterline products as they become available. 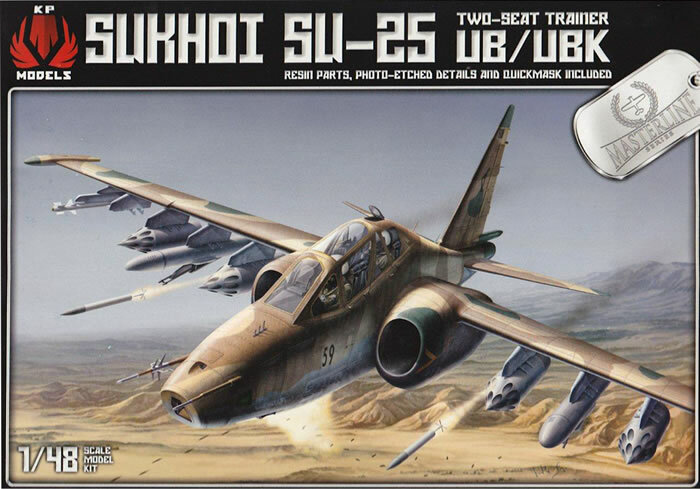 The supplied Su-25UB with all the resin, photo etch, masks and great decal options make this a value for money purchase in my opinion. 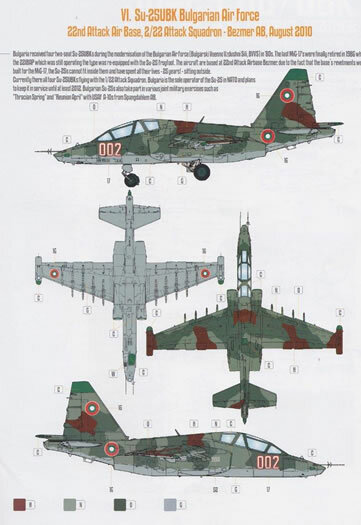 I’m an eagerly looking forward to seeing more eastern bloc aircraft released by KP Models.